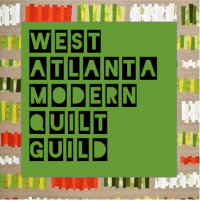 So one of my favorite quilt bloggers recently took down her entire blog, including all her wonderful tutorials and I was (am) seriously sad about it. One that I really loved and had always planned on making was a Giant Granny Square Quilt Block Tutorial and so I've been playing around trying to figure out the measurements and I thought I'd share in case anyone else is interested. The block above used 4" squares for all the patterned blocks and 4"x4.5" blocks for the white blocks. I looked at several other tutorials for Granny Square Quilt Blocks and the consensus seems to be that adding the length on the outside blocks ensures you have enough to trim a true 1/4" seam allowance around the edges. Seemed a bit strange but I did have a generous amount to square up with so I like it. But you know me and of course I wanted them BIGGER. The second block I made used 5" squares for the center (colored) rings and 5x5.5" blocks for the outer (white) blocks. Bonus here is that you could use precut charm squares for your center blocks! I've laid them out so you can see how to add the longer squares around the outside. Match the 5" sides and have the extra 1/2" on the outside (along the length). Join rows, making sure your 5x5.5" blocks are going lengthwise like the other - just center them on the colored block of the next row. Trim, making sure to leave 1/4" outside of the points! Voila! A truly GIANT granny ;-) This square measured 19.75" - my colored squares were leftover precut batiks and they were a little wonky but I didn't mind since this was just the test block. I know these might be a bit quicker sewing them together with the strip piecing method but truthfully I like doing them row-by-row as I think I always get more accurate blocks that way. Hope this helps you if you're looking to make a granny square quilt! Thanks for the tutorial. I wonder, would you use sashing on your granny square quilt? Also, where can I find a tutorial on the strip-piecing method? Thanks for the tutorial!! I made a block using the tutorial and I loved how it turned -- I used Halloween fabric and plan to use as a table topper later this year! Great tutorial. If one were to make the type of granny square that has more squares in it would they follow the same method as this tutorial and just add the additional row of 7 colored blocks to the middle? Not that I'm an expert ;-) but that it exactly how I'd do it! I'd love to see a picture if you do make a larger one!